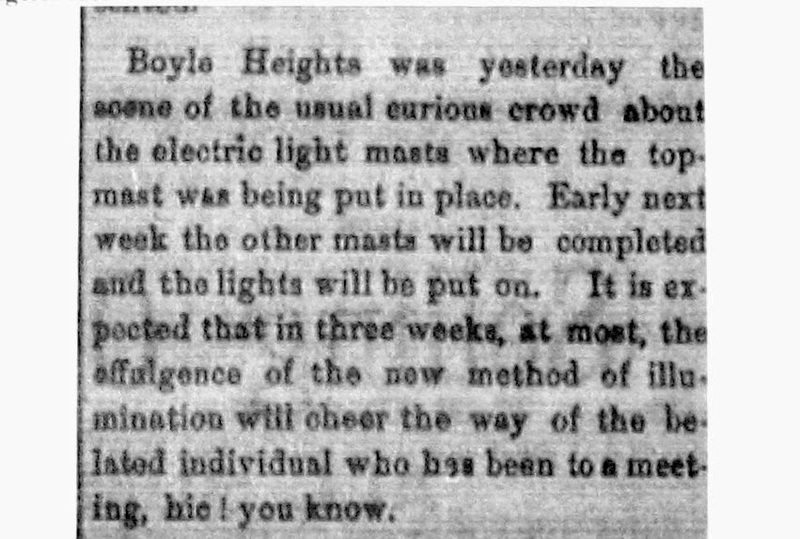 Introduction: This is the third of four posts on the coming of electric lighting to Los Angeles and the Boyle Heights neighborhood by Boyle Heights Historical Society Advisory Board member Rudy Martinez. The fourth and final installment will be posted tomorrow. In October 1882, Charles Howland incorporated the Los Angeles Electric Company and built a small brick power plant on the southeast corner of Alameda and First streets to house the Brush-licensed equipment. Soon after the structure was completed, work quickly began to erect and station the poles and to string the wires along the streets for the seven light masts. A short article appeared in the November 19, 1882 edition of the Los Angeles Herald regarding the construction at Aliso and First streets of one of the seven arc light masts that were to usher in the electric light age to the city. simultaneously two mast tops burst into brilliance before an admiring crowd of spectators. What a contrast with the dim murky light of the gas posts which for 16 years had served the city streets. As indicated in this description, Howland was unable to have all seven light masts ready on the same day, due to the delay in equipment arrival; thus, the mayor only switched on the light mast at Main and Commercial streets (where the 101 freeway now runs through) and another on First and Hill Streets. 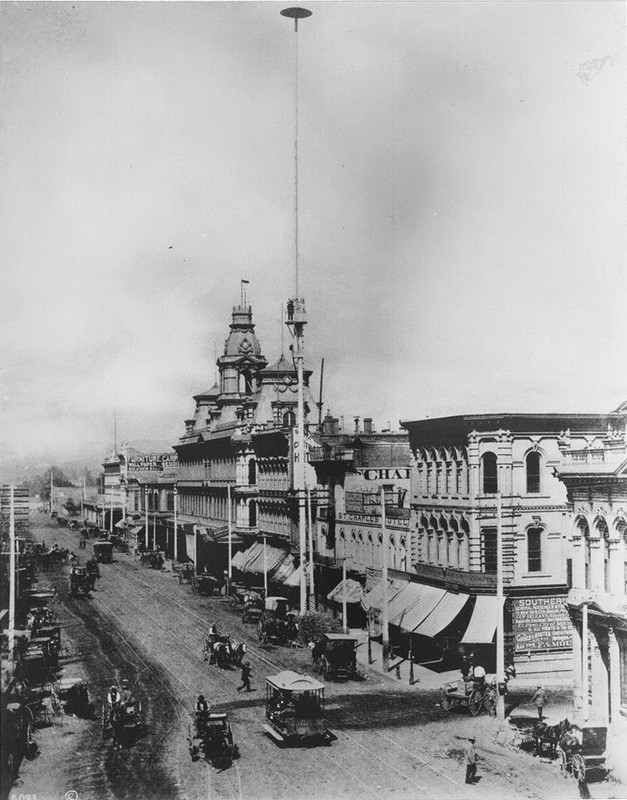 The first of the seven electric light masts switched on New Year's Eve 1882 and located on the east side of Main Street just north of Commercial Street (which is at the lower right.) The photo was taken from the Temple Block (now the site of City Hall) and what was then the triple intersection of Main, Spring and Temple streets. In the distance is the Arcadia Block, with the distinctive towers. Further down Main are the Masonic Lodge, Merced Theatre and Pico House hotel, which still stand at the south edge of the Plaza. Click on the photo to see it in an enlarged view in a new window. From the California Historical Society Collection at the University of Southern California's Digital Library. On the following evening, New Year's Eve of 1882, with much less reportage and ceremony, and only twenty-four hours after electric lights were introduced to Los Angeles, the electric light mast at First Street and Boyle Avenue was switched on. Boyle Heights, only seven years in existence, was now part of the electric age. The other four locations, (using present-day street names) were Avenue 22 and North Broadway in Lincoln Heights (the area was then called East Los Angeles), First Street and Central Avenue, Fourth Street and Grand Avenue, and Sixth and Main streets. It is interesting to note the planning decisions for the initial locations of the light masts. The city's elite no longer considered the Plaza area the heart of the city (which was mostly Mexican and Chinese) and the ascendant Anglo business class had now begun to establish a new bustling civic center south and west of the Plaza, with new modern services following. And a number of the more prosperous citizens were buying homes in the two newly developed and fashionable suburbs close to downtown, Boyle Heights and East Los Angeles (now Lincoln Heights). Property developers around the First and Boyle area in Boyle Heights were quick to tout the new light mast, featuring it in newspaper advertisements in both the Herald and the Los Angeles Times as early as February of 1883. It would be a fixture in their daily advertisements for several years. An advertisement in the March 8, 1884 edition of the Los Angeles Herald by Boyle Heights founder William H. Workman promotes the "30 Choice Residence Lots at the head of First Street" as being "near the Electric Light Mast." a good natured rivalry was taking place in Boyle Heights, between the electric mast people and the car-stable interest, each claiming that they were the head center and business section of the Heights. Apparently these masts were quite sturdy. The Times observed on July 21, 1888, that a runaway hay wagon pulled by a four-horse team crashed into the Boyle and First street light mast, and the wagon broke in half. This 1888 "Map of the Workman Orchard Tract" was drawn by surveyor J. A. Bernal (who was the focus on a post on this blog) and which shows the Boyle Heights electric light mast in the upper left vignette (click on the image to see it in an enlarged view in a separate window.) This item is reproduced by permission of The Huntington Library, San Marino, California. In a map published in 1889 of the William Workman property and vineyards, the “Electric Light” mast is plainly seen and identified on the upper left. These maps were generally produced to promote a subdivision, neighborhood or city and prominent features, like the light mast, were given attention as part of selling a well-planned and suitably outfitted area for potential buyers of property and structures.